One thing we all need to remember is that when women were on the streets, fighting for their rights to LIVE, they were fighting from NOTHING, THEY WERE NOT PRIVILEGED, they had no POWER, they had NO MONEY, but they did it anyway. They faced ridicule, beatings, being jailed and they were shunned, all so that women could be free. Men HAD THE POWER TO STOP THEM but the women would not QUIT they would not GIVE UP, they did it for US, for their children and their children and all the girls who would be born after they were gone. They were shinning stars that would not stop because they wanted a better world for those who came after them. Amazing women and THAT is exactly why nothing is taught about them BECAUSE THEY HAD NOTHING AND WERE AMAZING AND FOUGHT AND NEVER STOPPED UNTIL THEY GOT WHAT THEY WANTED AND THE MEN COULDN’T STOP THEM. I WANT THAT AGAIN. 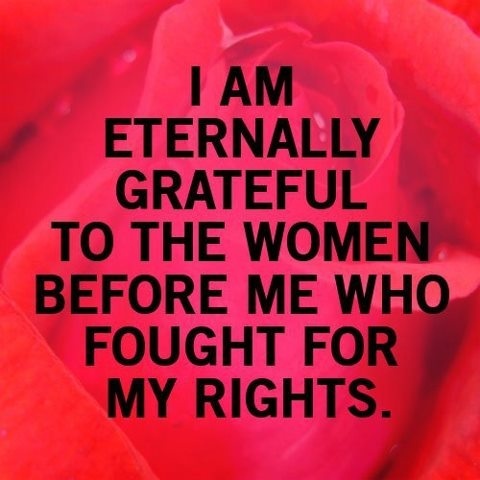 This entry was posted in Pinterest, Politics/Herstory, Uncategorized and tagged gratitude, Politics, Women. Bookmark the permalink. No we should’t and we need to pass our herstory along to our children…boys and girls alike. Boys grow up thinking women aren’t heroic and amazing because no one ever taught them that they have always been those things.